Walking through Hyde Park was a pleasant way to clear our minds. We entered Hyde Park thru the Marble Arch entrance and exited the park via the exit over on the other side. Freed from Monday morning blues, we eventually found ourselves at the opposite end of Hyde Park in an instant – and that’s the location of Prince Albert’s Memorial. From the Albert Memorial, you can see the Royal Albert Hall directly across the road, in which only a traffic light separates them apart. We’ll be visiting them both and this entry will be about the Albert Memorial and the Royal Albert Hall. The Albert Memorial was commissioned by Queen Victoria as a tribute to her late consort, Prince Albert of Saxe-Coburg-Gotha. The High Gothic monument was completed in 1876, 15 years after prince Albert died at the age of 41. Prince Albert was born in Germany as the second son of the Duke of Saxe-Coburg-Gotha. In 1840, he married his cousin Victoria, who had just inherited the throne of Great Britain. This memorial of Prince Albert is so grand, it even surpasses certain religious shrines/monuments found in certain Asian countries! Prince Albert is best known for his support of the Great Exhibition of the World of Industry of All Nations which was held in 1851 in Hyde Park and became a tremendous success. After the closure of the exhibition prince Albert put all his energy on an even larger project. He wanted to provide free cultural education by creating a permanent national exhibition promoting science and culture. Along a broad boulevard near Hyde Park, museums, concert halls and academies would be built. The grand project, dubbed ‘Albertopolis’, was unfinished by the time prince Albert died of typhoid in 1861, but by the end of the 19th century a whole cluster of cultural institutions had settled in South Kensington; they include the Royal Albert Hall, the Royal College of Art, the Natural History Museum and the Victoria & Albert Museum. Albert’s memorial was appropriately erected opposite the Royal Albert Hall, near the location of the Exhibition of 1851. 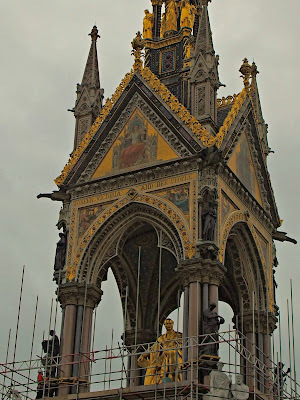 The memorial, Albert Memorial was commissioned by Queen Victoria as a tribute to her late consort. The monument, standing 175ft/53m tall, was built from 1864 to 1876 after a neo-Gothic design by Sir George Gilbert Scott. A 14ft/4m high gilded statue shows Albert seated under a pinnacle, holding a catalogue of the 1851 Great Exhibition. The pinnacle is set on a base with a large frieze. It is adorned with marble reliefs of 178 people, mostly artists. At each corner are four bronze statues depicting some of prince Albert’s interests: engineering, agriculture, commerce and manufacturing. At the bottom of the steps leading to prince Albert’s statue are four more sculpture groups, symbolizing Europe, Africa, America and Asia. The red brick Royal Albert Hall was built in the 19th century as a multi-functional music and entertainment hall. Today, it is one of London’s most recognizable landmarks and a top European performing arts venue. Built in honor and memory of Prince Albert, the husband of Queen Victoria and the official Prince Consort, Royal Albert Hall was a tribute to the prince’s affinity for the arts and his desire to establish in the city a permanent venue for the public to enjoy a variety of concerts, dance, and theatrical performances. The venue would be part of the so-called Albertopolis, which was to become a center for the arts and science. After the prince’s untimely death in 1861, Queen Victoria hired Captain Francis Fowke and Major-General H.Y. Darracott Scott of the Royal Engineers to design this proposed building, which was dubbed Great Hall. It is said that the two men were greatly influenced in their design by the ancient amphitheaters of Rome and Greece as well as by Gottfried Semper’s Opera House in Dresden. The circular hall was constructed of red brick with terra cotta ornamentation. In contrast, however, the dome at the top of the building – designed by Rowland Mason Ordish – was fashioned from steel. Records show the dome was first constructed in the city of Manchester, just to be sure it fit together properly, then disassembled and brought to London. 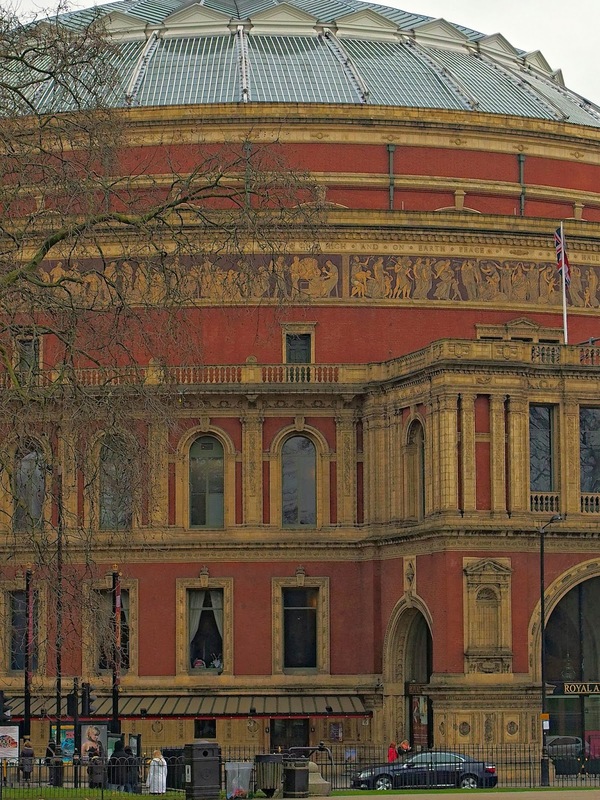 Royal Albert Hall hosts one of the world’s largests festivals of Western classical music – the Proms. The hall has also played host to a number of well-known pop artists throughout the last several decades, including The Beatles, The Rolling Stones, Abba and Meat Loaf. But the Royal Albert Hall isn’t just a music venue: over the years it has been used for events such as ice skating, tennis and even sumo wrestling! Check our road trips across Europe, in the links below!! Thank you very much, for reading!